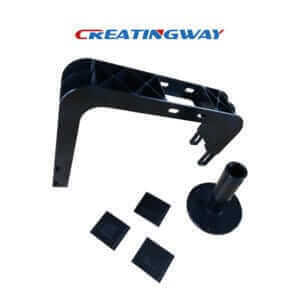 With the development, thin wall machined parts is now increasingly widely used in various industries because of its light weight, material saving and the characteristics of compact structure, etc. It is one of the high precision requirement of mechanical parts. But thin-walled machined parts processing problem, it’s always difficult to solve. There are many factors that can affect the machining accuracy of thin-walled parts, and deformation occurs when heated, stressed or vibrated. So according to those problems, how to improve machining precision of the thin-walled parts and guarantee the quality of thin-walled parts is important. In order to improve the machining precision of thin wall machined parts, let’s pay attention to factors may influent the thin-walled parts processing precision. Reduce the effect of clamping force on deformation. When the thin wall parts are processed, the clamping force should be evenly distributed. Use the axial clamping method as much as possible when the structure permits. Try to reduce the clamping force by using the expansion mandrel. Add some craft rib or flange to the workpiece properly so that the clamping force can be applied on the workpiece with good rigidity. Wait until the process is finished and then remove it. Reduce the influence of cutting force on deformation. Reduce the radial cutting force. Try to use the inner and outer circle machined at the same time, lead the component force of radial cutting cancel each other out. Reduce the effect of cutting heat on deformation. Reduce the generation of cutting heat. The most important thing is to choose the geometrical angle of the tool (increase γo、αo) and the cutting amount. Reasonable choice of cutting fluid. In short, for thin-walled parts processing and the problem may occurred like deformation, surface roughness value increased, etc., we just according to the properties of thin-walled parts, considering the problems existing in the process and adopt effective methods according to these problems, the high quality can be guaranteed and make it meet requirements.